Put your school holiday days to work! Earn community service hours at locations around the Seattle area. Each service project is different – register early and help decide where your Camp Fire service team will go! Teens will be guided by trained adult mentors who will serve as the event chaperones. Transportation will be made available if our service project takes us outside of the Seattle city limits. Teens should pack a lunch, snacks, water bottle, and dress for the service project. More details will become available closer to the event date. Registration for Teen Service Days will open as the school holiday approaches. Sign up for Teen Leadership updates and we will notify you when registration opens. 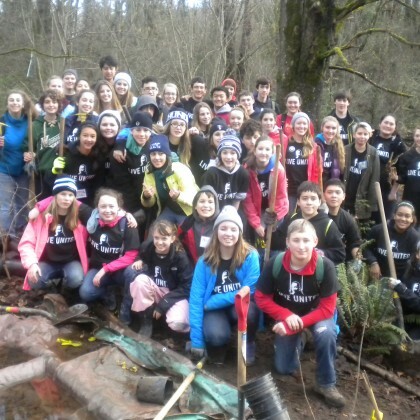 Camp Fire Central Puget Sound offers a variety of opportunities for teens to give service throughout the year. Many of our summer leadership programs are driven by teen volunteers who can earn service hours at Camp Sealth on Vashon Island, WA or at our Day Camps throughout the Puget Sound area. Join us for a Spring Break Service Trip and take a road trip around the state, completing service projects as you go. Learn more about our mission and philosophy of providing youth with opportunities to lead, grow, find their voice, and make an impact on their communities.